Everyone at the office was very nice! The doctor took time to explain everything and clearly discuss my options. Dental hygienistMagdalena was very gentle! I’ll definitely recommend them. Everyone at the office was very nice! The doctor took time to explain everything and clearly discuss my options. Dental hygienist Magdalena was very gentle! I’ll definitely recommend them. 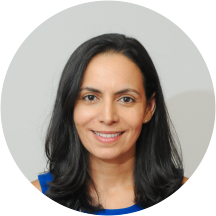 Marjan Moghadam, DDS, MA completed her dental degree at NYU in 2002. She completed a General Practice Residency program at Long Island College Hospital in 2003 and then earned her certificate in prosthodontics and masters degree in psychology from NYU as well. As a prosthodontist, Dr. Moghadam is able to manage and perform complex dental treatment involving full mouth rehabilitation through a combination of Clear Aligner therapy such as "INVISALIGN," crowns, bridges, implants and/or dentures. She is also a clinical assistant professor at New York University College of Dentistry, in the department of Prosthodontics where she serves as co-director of Clinical Fixed Prosthodontics. The staff at the office were very nice! She knows her stuff and communicates the technicalities very well. Dr. Moghadam is a very kind and knowledgeable she answered all my questions and concerns. The staff is very friendly . She is one of the most gentle Doctors that I have ever been treated by. She is extremely professional and caring and it seems like she is on the forefront of Dentistry as she lectures regularly for other dentists. It was a wonderful experience!! Dr. Moghadam is so caring and attentive with gentle hands. I would definitely recommend her to others. ???? I Felt Right At Ease From The 1st Moment To The End. I Will B Seeing More Of You. Cause U The Best ?????? Dr. Moghadam is like Christmas morning.